If you are a rock-n-roll couple, if you don’t like too formal weddings, you’ll get inspired by this wedding very much. Alana and Brian made casual look oh-so cool in their back porch wedding at Rock and Roll Cabin, let’s dip into it! The cabin was turned into a cozy oasis filled with pretty greenery, natural textures, and a fabulous charcuterie spread. The wedding guest list was kept list small to make sure the wedding felt intimate and romantic. The style chosen was minimalist modern mixed with earthy organic. The wedding ceremony took place under a wooden arch decorated with greenery and with a swing on it. 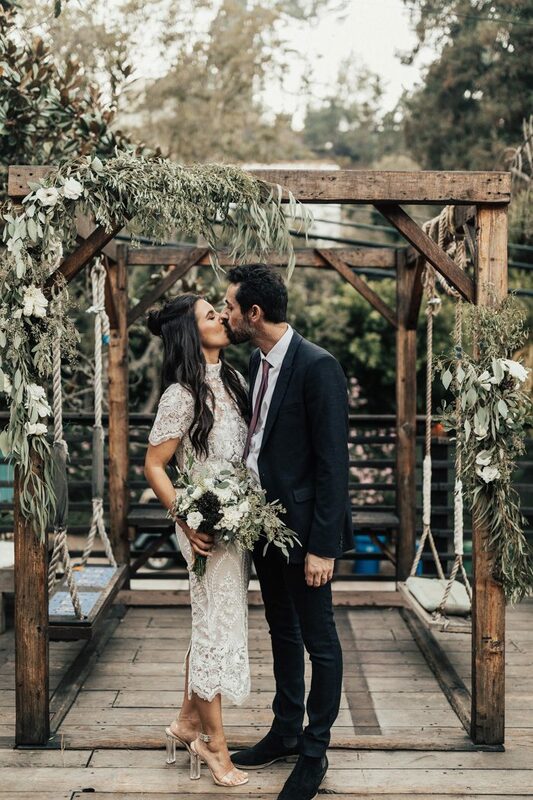 The bride was wearing a two piece lace ensemble from Stone Cold Fox and half-up messy bun look, and the groom kept it classically cool with his Topman suit and leather jacket. The wedding shoes were minimalist transparent ones, and the groom was rocking black suede Chelsea boots. The bridal bouquet was of white blooms and greenery. The wedding reception was styled with a wooden table, some greenery and candles. There was much tasty food, pizzas, charcuterie, cheeses and much more. The wedding cake was a white buttercream one topped with white blooms and greenery. The couple stayed true to their style and totally enjoyed themselves and their big day having everything they like and the closest people around. The post Casual Wedding With Earthy Organic Touches appeared first on Weddingomania.